200 drawings chart the transformation of Dalston, London. The arrival of 5 huge cranes at Dalston Junction, east London in 2008 signalled massive change to a once familiar area. 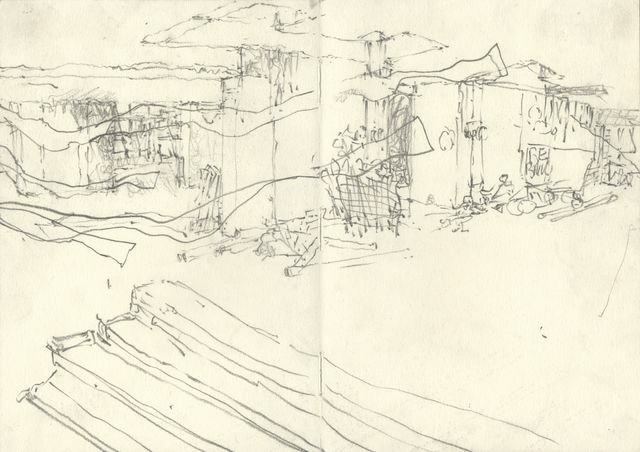 I began drawing from the streets, subsequently becoming artist in residence in the vast Dalston Square construction site - an exhilarating experience, literally climbing amongst the tower blocks as they were being built. The interior of the construction site seemed to run at a different time scale to the rest of the city, revealing a condensed, compressed version of the life cycle of spaces evolving over a longer time span throughout the city as a whole.